"It is rare that I have even one other Cortina to compete against in car shows but at this year's Lotus Owners Gathering (LOG 30), there were three of us and would have been four except for the alternator bolts which sheared off Ira Schoen’s car, while still 20 miles away. The Lotus Cortina of George Hartenstein I’ve been familiar with since we started coming to LOGs 25 years ago but Jeffrey Eisenstein had just finished a full restoration of his Lotus Cortina, and I’d never seen his before." 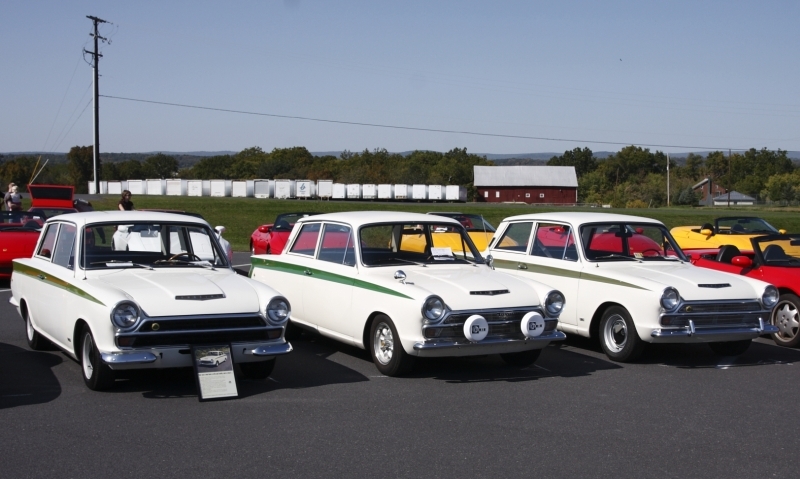 "Individuality isn’ t big in the Lotus Cortina world. I actually tried to unlock Jeffrey Eisenstein's car door in the parking lot (thinking it was mine) when our cars were parked a few feet away from each other. The cars do have some differences. Ours has quarter bumpers, a blacked out grille and the proper interior white rear view mirror. The other two at this gathering had full width bumpers, more modern black rear view mirrors and standard Cortina grilles. George’s has had the big driving lights since I first saw it. The Cortina that broke on the way was a Mk2 model so it would have been interesting. Variety is nice!" "We were very pleased to win 1st place in the Sedan class, really pleased to follow it up with 1sts with our Seven and Europa and a third for Sandy’s Esprit, and then amazed to be awarded Best of Show (out of 200 Lotus!) for the Cortina. I don’ t think that this has ever happened in the 30 years of LOGs." Copyright photo used by permission of Bob Cross.